Following the 30-year war for independence against Ethiopia, hundreds of thousands of Eritreans fled their country in search of international protection. Many returned in 1991 when Eritrea was admitted into the world community of the United Nations, but then in 1998 a border war broke out with Ethiopia, prompting the government to extend the duration of the national service from 18 months to indefinite duration without remuneration. 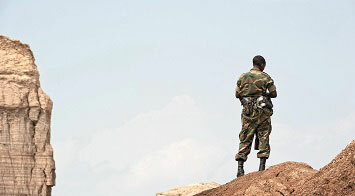 Further developments, such as the introduction of the People’s Militia in 2012, have seen Eritrea become the most militarised country in the world. As a result, hundreds of thousands of people living in Eritrea have fled the country to seek asylum worldwide, including to EU countries. I hope that my work will continue to raise awareness and guide government thinking because there is no doubt that, over time, the Eritrean national service has degenerated into forced labour or, quite frankly, a modern form of slavery. “Although far more Eritreans sought asylum in Sweden, Germany and Switzerland, it was Denmark, alarmed by the new waves of arrivals from Eritrea in summer 2014, that sent a mission to the country to allegedly document the conditions on the ground. The mission from the Danish Immigration Service visited London before they went to Eritrea and interviewed me twice,” says Professor Gaim Kibreab, Course Director of Refugee Studies. In March 2015 the UK Home Office updated its country guidance for Eritrea, based on the Danish report, wrongly concluding that Eritreans were no longer at risk of persecution if they returned home, even when they left illegally. With UK decisions concerning asylum determined on the basis of such guidance, this new Home Office guidance was also subjected to criticism by various human rights organisations and Professor Kibreab. As a result, in a landmark judgement, the Upper Tribunal relying on diverse sources, in which Professor Kibreab was also a key expert witness, issued a new country guidance on Eritrea. The finding guidance was based on the findings that Eritreans aged, or approaching, the draft age of 18, who have evaded national service, deserted or were likely to be suspected of doing so, faced a “real risk of persecution or serious harm” if returned to Eritrea. This will positively affect thousands of Eritreans in the UK. “This was obviously a very pleasing outcome, as I worked with immigration lawyers representing Eritrean asylum seekers, and civil society organisations, lobbying on their behalf to influence government policy and practice, as well as immigration authorities. My initial research on the topic grew to encompass significant engagement with national officials and policy-makers,” adds Professor Kibreab. “There have certainly been challenges to overcome, as gaining permission for foreigners to carry out social scientific research projects in Eritrea is next to impossible. Nevertheless, I succeeded in carrying out field research and published journal articles widely referred to by policy-makers and scholars. Also, my book, The Eritrean National Service: Servitude for ‘the common good’ and the Youth Exodus, for which I interviewed hundreds of former conscripts who fled the country after serving in the national service against their will, will be published in June 2017. Professor Kibreab has given evidence to immigration officials from the EU member states, including UK, Denmark, Sweden, Norway, Austria, Switzerland, Holland, Belgium and Germany. The findings of his research have also been made available to the rest of the EU member states through publication on the European Country of Origin Information (ECOI) website. He has contributed to a report on the Eritrean National Service for the Norwegian Country of Origin Information Centre – Landinfo, Swedish Migrationsverket, and Swiss State Secretariat for Migration, which are entrusted with providing information to policy-makers and adjudicators. The UK Home Office is now required to change its guidance on Eritrean asylum-seekers due to the latest guidance issued by the UK Upper Tribunal in which Professor Kibreab was heavily involved as an expert witness. Eritrean asylum seekers with legitimate claims can no longer be deported to Eritrea where they are likely to face risk of persecution. Although the Danish Immigration Service and the government did not withdraw the report of the mission, the report is no longer used as a basis for determining Eritrean asylum cases.